The main reason for curling of the paper in the papermaking process is that the paper sheet itself has two sides, coupled with improper drying conditions during drying, unreasonable drying curves, inconsistent drying rates on both sides, and unbalanced shrinkage on both sides. 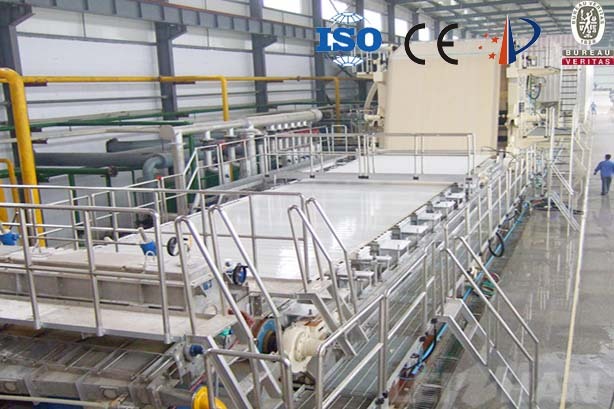 Therefore, raw materials, papermaking processes, and environmental conditions can be adjusted. During the forming process, the internal structure of the sheet, especially the structure and composition of the two sides, is adjusted so that they tend to approach each other to reduce the tendency of curling. Can be adjusted based on practical experience. Using a gradual increase in pressure to ease dehydration, a more uniform Z-sheet structure can be obtained. Such as shoe presses, keeping the upper and lower felts clean, are conducive to reduce the curl; choose the appropriate high roller. The drying process is an important external factor that determines the degree of crimping. Adjusting reasonable process conditions can reduce the degree of curling. Calender steam box is a way to ease the curl of the sheet. Under the premise that the forming section and the drying section form latent curling, the steam box is used to uniformly spray the steam to rewetting the previously dried paper surface, reducing the stress-strain difference between the two sides, and the upper and lower sides of the paper sheet tend to be consistent to overcome the single row. But this is only a passive defense, and the practical application effect is not ideal. It should also eliminate its internal factors in the forming and drying department. We manufacture whole complete paper making machine with high quality, contain paper pulp machine and paper making machine, if you have any need, feel free to contact us.